Only recently have humans gained the capability to willfully and technologically manipulate the environment on a global scale. This sort of planetary engineering includes present-day geoengineering proposals to counteract anthropogenic climate change by reflecting away a fraction of incoming sunlight. Although such a feat seems technically achievable, whether or not we should engage in such geoengineering is a question of ethics. Other, more futuristic, kinds of planetary engineering include plans for terraforming Mars to increase global temperatures and make the red planet habitable for Earth life. For terraforming as well, the technology for terraforming may be available today, but whether or not we should deliberately modify another planet is a question of ethics. I recently published a paper in the journal Astrobiology that develops a two-axis framework for comparing different views about how we value organisms, environments, planetary systems, and space. The ecological compass is shown in this figure with a scale from “space” to “intelligence” along the horizontal axis. This axis is intended to represent the vast diversity of life on Earth, from humans and other animals on the far right, to microscopic organisms near the middle, to planetary systems and space on the far left. The vertical axis of the ecological compass contrasts two types of value: instrumental value and intrinsic value. Instrumental value describes the usefulness or purpose that an object, organism, or system provides; for example, a logger may assign instrumental value to trees that are grown for lumber. Intrinsic value describes the an object, organism, or system as valuable for its own sake; in this sense, a hiker may view a tree as valuable simply by virtue of its being a tree. With this two-axis system, we can describe and compare various attitudes toward nature and their implications for planetary engineering. An anthropocentric view, which assigns instrumental value to all life other than humans, may find no environmental objection to planetary engineering. This is because anthropocentrism is only concerned with the effects of planetary engineering on humans. 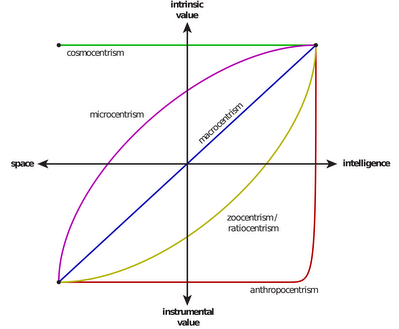 A zoocentric (or ratiocentric) framework extends intrinsic value to animals and gives at least some consideration to how human actions affect these organisms. As such, zoocentrism suggests that some consideration should be given to the effects of geoenginering on non-human animals. Likewise, a macrocentric viewpoint considers large, visible organisms as intrinsically valuable, while a microcentric viewpoint considers even microorganisms to possess intrinsic value. Under these ethical frameworks, the decision to terraform a planet such as Mars will depend upon the organisms that are already inhabiting it. Finally, a cosmocentric framework places intrinsic value across the entire biological spectrum from intelligent creatures and microorganisms to planets and space. This suggests that a cosmocentric ethical framework would refrain from any sort of planetary engineering because a planet is valued for its own sake. This ecological compass is intended to be used as a tool for discussions of human valuation of nature. As a tool it cannot provide the answer to whether or not we should engage in planetary engineering, but it can at least help us raise important questions about how we value nature in advance of any decisions.